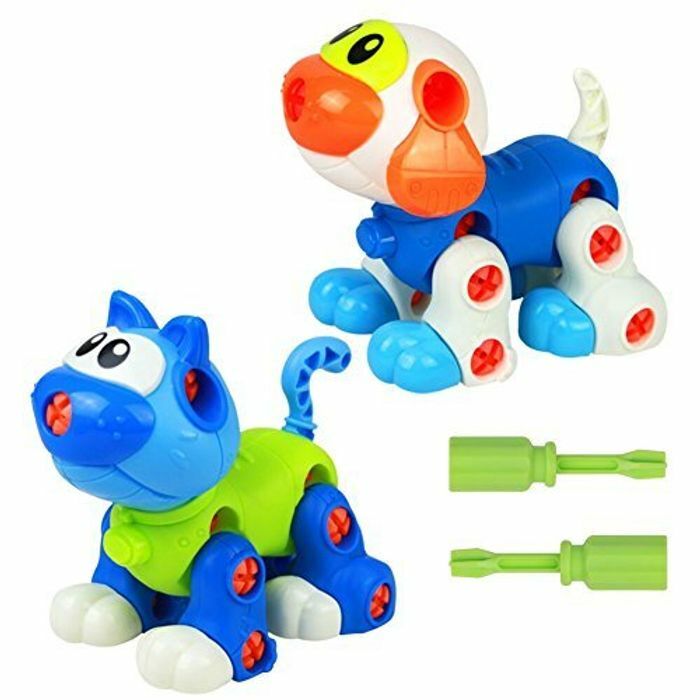 【2 Pcs Animals Toy Set】-- You will get set of 2 animals to play -- cute toy dog & cat toy. Funny dog cat toy for kids. 【"Walking" Dog Cat Set】-- With 4 wheels under the dog and cat, kids can push the animals toy to walk. A walking toy set to play on the floor, attracting children's attention and cultivate their patience. 【Take Apart Toy】-- Equipped with 2 screwdrivers, kids over 3 years can take apart or assemble them. This can buil up kids operation ability and cultivate their patience. 【Cute Kids Toy to Take】-- set of 2 in 1 package. Kida can take it during the travel. The dog cat toy are made of high quality durable plastic. Suitable for 3+ ages. Parents can finish it together with kids. 【100% Satisfaction Guaranteed】-- Handle all question and problem about this construction toy set & service, and do best to provide all customers with a 5-Star shopping experience.